As a kid, I had a habit of sticking amped audio wires into my mouth, so I could feel the way the audio waves changed the frequency of the voltage going through it. I later discovered that you could take those same wires and connect them to a small motor and cause the motor to vibrate at the frequency of the music. I would then take the motor and mount it to a cabinet and cause the whole cabinet to resonate with sound. Lately, I've taken an interest in wireless technology. I love the idea that one can take raw audio signals and send them through the air and pick them up in a remote location. Having several small children, I happen to have a wireless device handy: a baby monitor. It's a simple device; it simply has a microphone on one box and a speaker on the other. It's just a remote listening device. 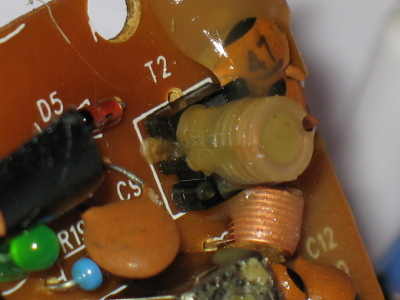 Here's the speaker end of the monitor. My first step was to connect some wires to the plug coming from the mandolin. I didn't have a spare jack handy, so I just used some electrical tape to secure the wires in place. Here's the back of the sending unit; I've got the wires going to the spot where the microphone wires are soldered into place. 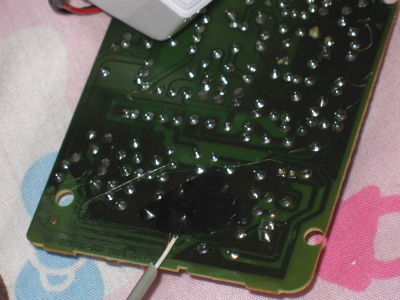 Here you can see where I cut the microphone wire. I needed to leave the microphone in place, as we still need to use the baby monitor for the baby. This is all just a proof of concept. I've ordered another $5 baby monitor from eBay so I can fully take it apart. I'm not 100% positive, but I believe this is the business end of the sending unit. The antennae is wired into the cylinder at T2, so I have to assume that it's the actual wireless sender. Pretty steady for a 4-year old. And pretty decent sound coming through the wireless amp. This story got picked up by boingboing and by Make. Neat. Wow! What a cool trick! Good photography by Hayden too!! I sure get a kick out of you in such a "girly" room. :) I love the Hello Kitty in your picture. 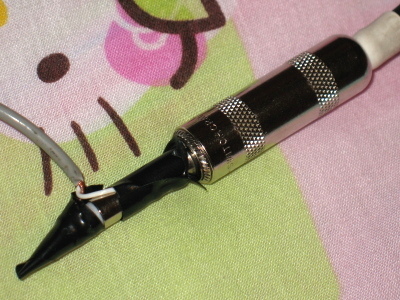 I suggest that you connect (2nd pix of wires taped to plug) the shield to the sleeve of the plug and the white wire to the tip. You will have less hum. Found you through BoingBoing. You rock...in your pink room. :-) I added you to my RSS feed. Now maybe I can play my Mandolin badly, but loudly. Love your political and corporate stuff too. 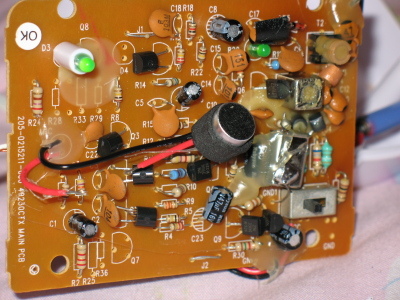 Tried putting an amping circuit together with a power supply and a 3.5mm audio plug? headphones would rock. "I love the idea that one can take raw audio signals and send them through the air and pick them up in a remote location." Yeah, it's called RADIO. LOL. It was discovered by Herr Doktor Hertz more than one hundred years ago. Place: Why on your blog of course . . .
What: This shower is to celebrate Kristen and the new life of Alyssa Star. To do that you might post a song, a quote, a poem, a piece of art that reminds you of the spirit of Kristen. Also, along with something inspired by Kristen, you might post a piece of wisdom or caring for Kristen to hold on her new journey into motherhood. Of course, in addition, you may also buy a traditional baby gift. If you do, we want to see a pic on your blog!!! How: Post your gift on 3/18/08. I will create a link to everyone participating and post it on The Meantime. wow nice filming for a 4 year old!!! i tried to do a similar thing except with a old wireless phone, but now it won't go into "talk" mode. I did this a long one while ago. 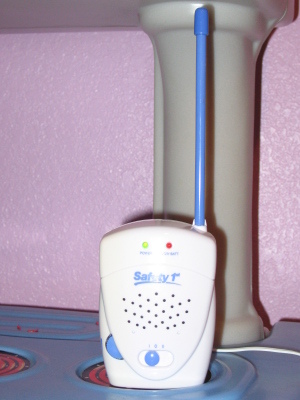 On the first try I blew out the baby monitor transmitter sending line level audio into the microphone terminals. On the second transmitter I stuck a 20K resistor (I think) in series and no more problems. I've been being harrassed by amplified breath sounds for almost a year now. I couldn't figure out what the person was using. I called geek squad and the guy suggested it might be a altered baby monitor. If that's what it is, is there anyway to stop him besides staying up all night? Annette - I'm not exactly sure what you're describing. Are you hearing the sound on one of your baby monitors? Baby monitors often have multiple channels, so if you're receiving unwanted interference on your monitor, perhaps you can change the monitor channel? Great explanation of the baby monitor wireless amp! You can do something similar with old cordless phones that you can find for about 5 bucks at thrift stores. Just find one that has a "page" or "intercom" feature. They work by allowing you to push the button and hear yourself (or allow someone else to hear you) on the base station speaker (which is used ordinarily for the speaker phone). It's also possible to de-wire the cheap little speaker and run those wires to, say, a computer speaker (still cheap and little, but better). Sound quality is increased, but you really have to experiment around to get one that doesn't chop off a lot of your guitar's frequencies. You should consider getting your Amateur Radio License (i.e., ham radio). With that, you can build your own radio transmitters, use high power transmitters, and buy equipment typically not available to the general public.